← Was Rambo Right? II – Are the Neocons Throwing John McCain Overboard? Ron Unz part 1. 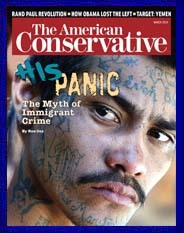 Ron Unz, publisher of the American Conservative, discusses the myth of immigrant crime. Ron Unz contends that crime rate among immigrants and illegal aliens – particularly hispanics – is much lower than commonly believed. This entry was posted in Immigration/Race, Television/Video and tagged Hispanic Crime, Immigration/Race. Bookmark the permalink.